I live in a purple part of the country (Virginia) and move in academic circles, so of course I know many, many people who will be voting for Obama. It is impossible to know, but if I sodomized the Easter Bunny in front of their children the look on my Obama-voter friends’ faces could scarcely be much different than the look they get when I say I am voting for Jill Stein. The pain in their voices tugs at my sympathies; their fear is very real. I want to reassure them, but I was cured a few presidential elections ago. I won’t be drinking from that cup again. At first they assume I don’t understand what’s at stake. They tell me about the Romney/Ryan agenda. They tell me about Obamacare. They tell me about DOMA and the Fair Pay Act. But the conversation wanes when I am not only unsurprised by the information but able to supply amplifications and corrections. I’ve read the (detailed summary of) the Affordable Care Act. I know about Romney’s probable agenda. I even know the age and bodily afflictions of key members of the Supreme Court. In short, I know what’s at stake. This is awkward, and for some there is no plan B, but experienced partisans know where to take it next. There is something wrong with me. I’m a purist, a liberal elitist who won’t be satisfied, arrogantly “engaging in a form of rhetorical narcissism and ideological self-preoccupation.”1 I indulge in a “pernicious idealism that wants the world to be perfect and is disgruntled that it isn’t.”2 I trade the common good for private conceit. Fortunately my friends are mature people with trained minds, so for most it is enough to mention the ad hominem fallacy, to remind them that my personal faults–which I stipulate are legion–aren’t relevant to the validity or otherwise of my position in this debate. Usually we can agree to leave that brand of “discourse” to the professional bloviators. So at last we come down to it. What are the arguments? There seem to be only two reasons for a progressive to vote for Obama. Either (1) you think Obama is not so bad, really, and has done a lot of good and could do more, or (2) Obama’s record makes you green about the gills, but the thought of Romney winning is intolerable. Obama enthusiasts have by heart a widely-circulated3 list of his achievements: The Fair Pay Act, the auto bailout, legislation for credit card reform and hate crimes and student loans, some tax cuts, repeal of Don’t Ask Don’t Tell, raising fuel efficiency standards, and ending the war in Iraq. Some also add killing bin Laden, the stimulus, and a new Start treaty with Russia. Everyone adds Obamacare. Some of these really are achievements. The Fair Pay Act is a no-brainer, for one. Others are marginal. Credit card reform stopped some abuses but left millions imprisoned by usurious interest rates on their debt, with their homes and futures at the mercy of predatory lenders. If you are drowning it is definitely better to have fewer stones around your neck. You still drown though. But enough: he’s done some good things. Is that enough, or should his merit be judged on the whole of his record? This matters, because the weight on the other side of the scale is not insignificant. Some of these are marginal too. He’s deported more people than ever, but made some concessions on immigration. Others are not entirely his doing. (Congress helped, passing the NDAA for instance.) Some, like making life hell for medical marijuana growers, are difficult to understand. But unfortunately the seriousness of some of his actions is on a different scale entirely. The country has been bankrupted by war and its reputation ruined, but the lies that got us there will never even be investigated; that was ruled out by Obama practically the moment he took the oath of office, the first of many betrayals of expectations he engendered in his supporters. The banksters who tanked the economy and destroyed the nation’s wealth likewise received blanket immunity. The “stimulus package” given to financial elites was many, many times bigger than the one the rest of us had to share, locking in the material ruin of the working class. He expanded the pointless war in Afghanistan and extended military assaults to many other countries in Nixonian secrecy. He continued every Constitutional excess of the previous administration and extended them to include new grants of executive-branch secrecy and extra-judicial power, to include not just war-making, kidnapping, and indefinite detention, but assassination even of American citizens.4 Obama has done more to render the U.S. Constitution a dead letter than every previous right-wing administration combined. If that is something you can put on the same scale with credit-card reform and call it even, I respectfully suggest you re-examine what is usually meant by the words “progressive” and “liberal.” And “American,” while you’re at it. The presidential oath of office is to defend the Constitution, and this president knowingly betrayed it. That issue isn’t even partisan: Some, no, every future president is going to use these precedents, and when they are used against you you will have no judicial recourse thanks to Barack Obama. So if you think Obama is not so bad, really, and has done a lot of good and could do more, then by all means vote for him. And you can stop reading now–the rest of this essay will be of no interest to you. The rest of us, reviewing this administration’s record and its likely future course with dread, face just one question. Must we reelect Obama to save the country from something worse? This is a serious question, and calls for considered analysis. Notice first that “Romney’s worse so we have to vote for Obama” isn’t an argument, or even a syllogism. What people really mean is something like this. (1) A Romney presidency would be worse than a second Obama administration, and (2) if Obama isn’t elected then Romney will be, so therefore (3) we should vote for Obama, at least in any state where our vote might make a difference. Certainly one can’t quibble with the second premise. The probability that neither Obama nor Romney gets elected is exactly zero. The first premise too at first blush looks irreproachable from a progressive perspective. Mere common sense seems to endorse the conclusion once the premises are stipulated, and most folks think no further.5 They don’t have to agitate their consciences over voting for the war criminal, corporate lackey Obama, they can just vote against the likely greater war criminal (and proudly greater corporate lackey) Romney. And all the rest of it follows too: maybe Obamacare is a sell-out to big-insurance and big-pharma, but at least they won’t get their greedy mits on Medicare. (Well, this time. Probably.) And so on. Those of us growing gray about the temples are struck most by the argument’s familiarity. We have heard it–and consented to it–often before, in fact about once every four years. Replace Romney/Obama with McCain/Obama, Bush/Kerry, Bush/Gore, Dole/Clinton, Bush/Clinton, Bush/Dukakis, Reagan/Mondale, Reagan/Carter, Ford/Carter–no wonder it rings bells. In every election for 36 years a center-left Democrat has run against a center-right Republican, each campaign pandering to their more ideological supporters, and in each case the elected administration tossed a few bones to their left/right base while dutifully serving elite interests. Meanwhile, as elections come and go, both ideological conservatives and ideological progressives find the country moving away from them; not towards their ideological counterparts, but towards a corporatist, oligarchic security-state. The electorate is apparently not in charge. Those who are in charge find the partisan electoral process useful because it keeps a potentially dangerous population quiescent, occupied like loyal sports fans not with what is actually being done to them, but with the business of “winning.” This is a classic method of control, used by elites in one form or another throughout the ages. Tiny little England built a global empire using it. It works equally well on the unsophisticated and the ostensibly educated. Check yourself: if you have mentally colored yourself red or blue, if you see the country as made up of red, blue, and purple blotches, then your political identity is no longer yours. You have been co-opted. Occupied. Welcome to the game. By itself this doesn’t disprove the partisan argument, and many progressives point to such achievements as increased LGBT rights as proof that voting for the less-bad can result in genuine positive change; that likewise the assault on women’s reproductive freedom shows the danger in allowing the other side to win. These are excellent examples, but those using them to urge partisan loyalty omit the essential point that these changes have been occurring independently of which party is in power, because the motive force behind them is serious activism, not partisanship. Gay rights activists have fought a long and sometimes brutal campaign characterized not by loyally supporting the Democratic Party but by confronting it, by being prepared to play hardball with politicians who won’t get in line. Anti-abortion forces have done likewise. That point deserves a double-take: The core activists driving actual political change don’t hesitate to imperil a nominally allied candidate’s election if that candidate appears insufficiently committed to their cause.6 This fact is obviously a key to their success, and it strongly suggests there is a problem with the partisan argument. But what, then, is the error in that argument? As it happens, this very week’s news reports furnish an example that illuminates it completely. The relevant point is not the seriousness of this development–which I hope goes without saying–but that no Republican president could have gotten away with it. It’s the “only Nixon can go to China” principle: in a democracy only a nominally liberal leader can put in place the machinery of a totalitarian state, just as only a nominally liberal leader could gut the social safety net (Clinton), or put privatizing Social Security and Medicare on the table (Obama). This is a clear counterexample to the claim of the first premise–that a Red president is bound to be So Much Worse than a Blue president–and thereby reveals that the partisan argument is unsound. Let me be quite clear: it is not unsound because of the differentials on some set of policies or issues. Partisans will argue that in this election there are issues–the Supreme Court, Medicare, etc.–where there is a clear choice, and that is true. It is always true, every four years, as sure as the tides. That is by design: the political gamesmanship the argument draws us into is itself the trap. By constraining our discussion to the acknowledged differences between the sides, partisanship tricks us into supposing their similarities aren’t an issue, when in fact their similarities are the most critical issue. This is because their differences will remain in contention regardless of who gets elected, but their similarities assuredly will not. If Romney is elected, he will re-empower neocons and serve the interests of the national security state with (perhaps) greater zeal than Obama would, but with this difference: his every move will be scrutinized and hampered by a determined opposition. Also if Romney is elected, he will try to privatize Social Security and Medicare and transfer even what little remains of the nation’s wealth to the oligarchs–but he will face the same wall of opposition that stymied Bush on these issues. Obama, on the other hand, can continue to negotiate away Social Security and Medicare and progressive taxation and face only whimpers from his own base. Romney may nominate a justice likely to reverse Roe v. Wade, but it would be with the certain knowledge he was engendering an electoral tsunami against Republicans that would last a generation, if not forever. Obama will nominate another corporatist jurist certain to further indenture flesh-and-blood citizens to their corporate-citizen betters, and pay no political price. From the bank bailouts to climate change to Israel/Palestine to the Patriot Act–one could go on for pages, and the story would in every case be the same. This dynamic at work in American politics is now evident even to the willfully blinkered. It is a dynamic that will not change if Obama is re-elected with solid liberal support. Why would it? It will also not change if Romney eeks out a victory despite solid support for Obama, because whatever new reactionary or militaristic policies Romney succeeds in perpetrating will be loudly condemned by the next Democratic presidential candidate, who, if elected, will then adopt them. The only point of leverage is here: whether Obama wins or loses, if progressive third party candidates get enough support to scuttle the Democrat in a close race, change is possible. This is not wishful thinking, but an empirical observation. Every successful progressive movement in our history has illuminated this path to change. Politicians are not ideologues but pragmatists. They need your vote to get elected. If you deny it to them, the next one will learn to whistle your tune. The partisan argument for progressives to hold their nose with one hand and vote for Obama with the other is thus refuted, but the larger point introduced above bears emphasis. As I have documented elsewhere9, the partisan duopoly disenfranchises the entire electorate, left, right, and center. The American people as a whole, irrespective of ideology, have been locked out of running their own country as the writers of the Constitution intended they would. The mechanism at its root is dead simple and works in exactly the same way on both “liberal” and “conservative” voters. You are offered two choices, each of whom has been carefully vetted by the owners and is dedicated to serving elite interests. You are then persuaded that one of them is bad and must be voted against. As I have shown in my book The Good American: A Situation Report for Citizens, the real challenges facing America and the world are far more dire than most people realize, even those who make an effort to be informed. Unless Americans reclaim their government, and soon, we stand to lose everything; our democracy, our livelihoods, our liberty, and the ecological foundation of civilization. It will not require a wholesale conversion of the electorate to political activism. It only requires enough of us refusing to play the partisan game to break the duopoly’s lockdown on political discourse. At that point the gates of the political arena are unlocked, and the course of the nation can once more become subject to the will of the people. 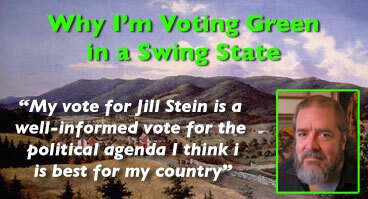 My vote for Jill Stein in swing-state Virginia isn’t a protest vote, it isn’t an angry vote, and it isn’t elitist. It is a well-informed vote for the political agenda I think is best for my country. The United States of America is (or can be) a Jeffersonian democracy, and I am a citizen. Casting this vote is my civic responsibility. What’s yours? B. Sidney Smith is a recovering math professor, gardener, and creative loafer living near Appomattox, Virginia. His autobio, curriculum vitae, favorite recipes, and much more besides can be found on his website, bsidneysmith.com. 5. It is formally valid by disjunctive syllogism (modus tollendo ponens): ((O or R) and notR) implies O. 3 Comments on "Voting Green in a Swing State"
I share many of your concerns with Obama’s achievements. My chief 3 are drone murders, insurer handout rather than single payer universal, and impotent financial reform with zero real prosecutions while the scandals continue unabated. Nonetheless, I share your academic friends’ position. Jill Stein cannot win. A vote for her is a vote for #Mittens. Be a pragmatic realist. Drink from the cup. Not in support of flawed policy, but in opposition to disastrous policy. Dr. Stein could’ve mounted a primary challenge and made her case in a relevant forum. Many of us would’ve supported her against Obama then despite her lack of record. But not against Obama when the only consequence is to aid Romney. Agree totally. We also must realize that even if we temporarily make some wins against the Duopoly, as Franklin Roosevelt did A LITTLE BIT under Progressive Party and Socialist Party pressure, the Duopoly will always dominate because the USA has always been a pseudo-democracy. We Greens have a plan for true democracy with proportional representation, especially. With pro-rep, no more 2-party system. I loved your article on this presidential election. I’am a African American women, who has been scream at for crossing over, and voting for Jill Stein for president. Of course I had to hear all the many things that you wrote about, but much more! How proud I should be since, we were slaves to see a Black President. I don’t agree with Obama’s policies towards the poor and how he has treated African and Latin Nations. As a black person I have seen no change, nor have the African American I know. He has promise Blacks nothing, but yet he wants our vote!